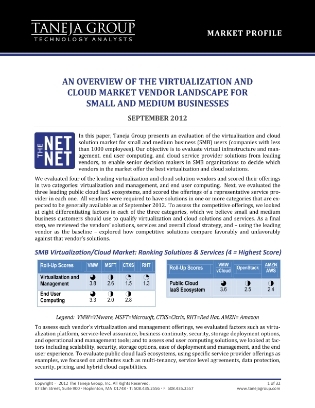 The cloud and virtualization market are flooded with choices. You have to pick the right vendor and you also need to find the right offering and type of cloud best suited for your organization and budget. This can prove to be a challenge for a small or medium-sized business with limited resources, which is why we’re here to help with today’s featured resource. This white paper reveals the results of an independent study that examined four of the leading virtualization and cloud providers – VMware, Microsoft, Citrix and Red Hat – to see which one performs the best and provides the best value. Read on and also discover an analysis of three leading public Infrastructure-as-a-Service providers and more.